Ingredients: Organic Peanut Butter, Protein Blend – No hormones or antibiotics (Milk Protein Isolate, Whey Protein Isolate), Organic Tapioca, Organic Inulin (Organic Prebiotic Fiber), Organic Goji Berries, Svetol® 400mg (RAW, Naturally Decaffeinated Green Coffee Bean Extract) and Lots of Love! • 74% Organic • Gluten Free • Non-GMO just for you perfectionists. 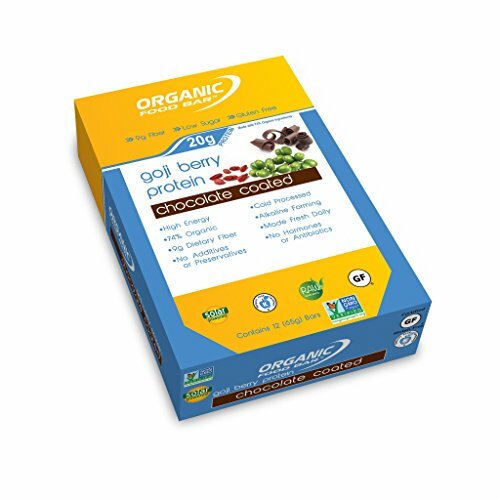 Organic Dark Chocolate (Organic Unsweetened Chocolate, Organic Cane Sugar, Organic Cocoa Butter). A classic combo of Organic Belgium chocolate and yes, Organic Peanut Butter. Great nutritional value without compromising the taste! If you have any questions about this product by Organic Food Bar, contact us by completing and submitting the form below. If you are looking for a specif part number, please include it with your message.